Going out to have a drink with a friend or family member, always an enjoyable time. Meeting friends at a pub for dinner, some music, a good laugh, awesome. But how would you feel if you were being recorded without your knowledge and that advancing facial recognition software could identify you without your permission? So here is the situation – You and a friend walk into a neighborhood bar, order a cocktail, and, unbeknownst to you both, a camera above is scanning your faces to determine your age and gender. Your details are then combined with data on other bar patrons and then made available via a mobile application for users trolling for a good-time venue with the right genetic make-up. SceneTap is a maker of cameras that pick up on facial characteristics to determine a person’s approximate age and gender. The company works with venues to install these cameras and track customers. It also makes web and mobile applications that allow random observers to find out, in real-time, the male-to-female ratio, crowd size, and average age of a bar’s patrons. And there is no way to avoid it if you are there. Launched in Chicago last July, SceneTap is now live in seven markets, including San Francisco and Austin, and has tracked more than 8.5 million people at 400 partner venues. Bamboo Hut, Bar None, milk bar, The Abassador, Fluid Ultra Lounge and 20 other San Francisco locations now have the i-spy cameras in place. SceneTap promises that all data is collected anonymously and that nothing is recorded or stored. For nightlife-lovers, it’s a fail-proof way to get a preview of a bar or club. Venues can offer specials, and are given tools to measure the effectiveness of their campaigns. Marketing measurement at its finest. Is this over the line for you? We all know that privacy went out the window a long time ago, but now this? In the case of Foursquare, for example, the consumer is in charge. You decide whether you want to share this information or not. With SceneTap, the consumer has no say in the matter. Walk into one of these bars and you’re being digitally sized up — and there’s nothing you can do about it. What happens when they start to capture additional personal information such as height, weight, ethnicity, or wealth? Let me know what you think by posting below. There is a such thing as too much information. As a consumer I don’t need to know the exact demographic of the establishment I am going to, it takes away the “thrill of the hunt”. I like to try out places and not know EVERYTHING about them. Technology like this would start to diminish the fun of trying out the restaurant that just opened down the street. Instead I’ll check my phone and say “geez you know what this place has a very 30+ crowd”. For business owners they should be savvy enough to recognize who their customers are and cater to their wants/needs without the help of facial recognition camera. If they can’t their business probably deserves to fail anyways. Now from a census type of stand point I could see how something like this could be valuable. Anonymous collection of basic demographic data from a camera set up on a main street in a town/city/neighborhood could be very valuable. It is inevitable this type of technology will become more prevalent as time passes. We can complain all we want, but there isnt much we can do to stop it if there is a demand for this type of information. This is a rather fascinating topic and the application of the technology is superb, or so it would seem. As far as how I ‘feel’ about the information being made public? I couldn’t care less. The information being gathered, in its current state, is nothing that any random person in public couldn’t already figure out about me by just looking. None of it is truly ‘personal’. It would be no different if a bar employee walked around every 15 minutes and counted the boys/girls and approximate age and fired off those summaries to an email list of some kind, or posted them on their website. Now, if they start gathering/broadcasting truly personal information like names, occupations, addresses, etc… That is when I would start to be worried. Things that a stranger cannot tell about you simply by looking at you are what should be protected. But public observations? Not worth worrying about. sounds like a lawsuit in the waiting. not that it matters much, the NSA is already recording everything. This is on the edge. But I think I would not visit such an establishment. Unfortunately most other folk will have no bother with that system. And I think in Switzerland it would still be illegal. It’s a little creepy mainly because you don’t necessarily know which establishments have SceneTap installed, but seems like they’re collecting less personal information than I give every day by making purchases online or using my credit card in brick & mortars. Definitely has the potential to cross the (my) line if they make the jump from simple facial detection to actual facial recognition. Scary? Yes. Intrusive? Without a doubt. Unexpected? Absolutely not. Targeted marketing works so well (and we consumers love it) that some day in the not too distant future, there’ll be a way to track our every move (microchip in your brain, anyone?). The only issue I have with the i-Spy cameras is if they’re in use with no signage to alert customers so they can decide for themselves if they want their data collected. That way, when I see the prominently displayed i-Spy sticker on a club’s front door, I can happily skip that venue for a more private one. All this worry and concern over SceneTap is completely unfounded and, more importantly, unnecessary. I know and am friends with one of the creators (Marc Doering) and almost worked for SceneTap before they decided to move operations to Austin, TX and required everyone work out of that office. They are collecting no data that, as Chris D. said, isn’t already publicly available for anyone to see just by taking a quick scan around the bar. And, in response to Laura, yes, you DO know what establishments have it installed because they have big signs by the door(s) disclosing the fact that SceneTap is being used and you’ll be on camera once you enter the bar. 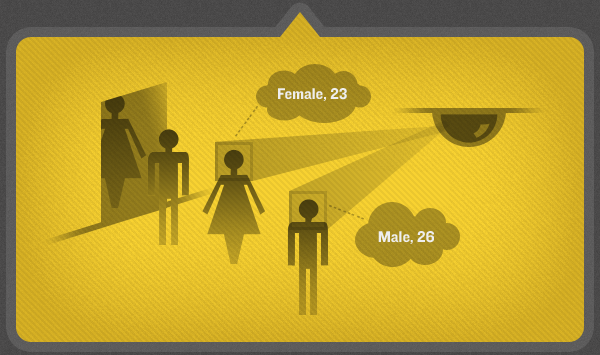 For one, SceneTap does not use facial recognition cameras. They use facial detection, which in no way, takes or stores pictures of people. You can read more about this here: http://www.scenetap.com/about. Also, SceneTap doesn’t “make” any cameras. That’s a different industry. As far as not knowing which establishments use this technology, every venue that is utilizing SceneTap has a decal on the front door. In a sense, all SceneTap is doing is providing information that any regular person could retrieve themselves by walking into a venue, in a way that is more informative and purposeful. I for one, think it is a great idea, and use the application all the time! Webman…. George Orwell comes to life ! Totally over the line…..
>> All this worry and concern over SceneTap is completely unfounded and, more importantly, unnecessary. you have way to much trust in the powers that be 🙂 and your response to me will be that I’m paranoid, but my link to the wired.com article is proof that I am not. So what is the next step… Actual facial recognition? The bar would still need to know who you are…. but wait they do… http://techcrunch.com/2011/11/01/researchers-flood-facebook-with-bots-collect-250gb-of-user-data/ … if it were me I would run bots on every social network and build a database of names, friends, age, groups, music likes, and of course single image photos. I would then cross-relate this database against scanning your id at the door to make sure my database was accurate if it wasn’t I would adjust it. At the end of the night I would access my point of sale and associate all of your purchasing habits to your profile via your credit card transactions. I could further improve my information for monetization purposes by making my door scanner associate groups of ids (people that appear to be with each other). Scanning tables and booths would allow me to do this as well. Cross relating information that we readily give out everyday is a very powerful tool. As a bar owner I can now control pricing to improve my margins based on who is in the building. I can make happy hour last just long enough. I could offer free drinks to the person via SMS that always seems to be at the booth or get to my club first out of a group to encourage them to come to my bar. If that tease didn’t work I could keep giving out free drinks or discounts in the order of who arrives 1st in that group until I find the person I need to attract first next time. This is all just using direct relationships between social identity. What about improving the bar itself. What music I play based on the music that is preferred in the room. If your thinking well that wouldn’t work think about if I utilized your spotify or pandora listening trends which are linked to your social networks. The fact is we are a much more open community than we used to be. That doesn’t have to be scary. Privacy is important but so are glassdoors. It is my opinion that the older demographics fear this openness more than the younger ones. Webman’s own linkedin profile is filled with experience in database driven marketing. I have no doubt that regulations controlled the collection of that data and I have no doubt that in most of the cases the individual signed over their right to that information. I am also sure in most all of the cases how they were being made aware of that data collection was no more or less suspicious than a nondescript door decal. My point is that this collection or processing of public information is no different than anything else we experience everyday. WHO ACTUALLY READS THE TERMS OF SERVICE AGREEMENTS ON SOFTWARE OR FREE WEB APPLICATIONS?